Dr. Randy K. Avent is the founding president of Florida Polytechnic University, the newest of the state’s 12 public universities and the only polytechnic university in the State University System of Florida. As Florida Polytechnic University’s inaugural president, Avent is responsible for the development and operation of the university and is committed to strategically developing Florida Poly as a research and jobs university, an agent for growth and a beacon for the economy. His career exemplifies the qualities of innovation, leadership and entrepreneurship the university seeks to instill in students. An accomplished academician, senior administrator and research scientist, Avent has an extensive background teaching and directing research at higher-education institutions dedicated to science, technology, engineering and mathematics (STEM). 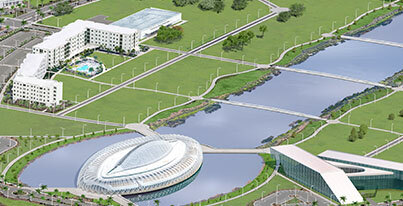 At Florida Polytechnic, Avent will focus on the core STEM disciplines of engineering, analytics and informatics, and computer science, which are considered key to economic growth and prosperity for Florida and the nation as a whole. Establish sound financial growth, stability and administrative practices. Before coming to Florida Poly, Avent served as the associate vice chancellor of research and a professor of computer science at North Carolina State University. There, he was responsible for growing NC State’s overall research program and was the principal investigator on the Laboratory for Analytic Sciences. He also led an interdisciplinary effort to grow data science at NC State through a cluster hiring program, introduction of new courses and development of a new research institute. Prior to joining NC State, he served as the chief scientist in the Defense Department’s Office of Basic Research, where he oversaw science programs, developed strategic plans for basic research investments and led a national “Data-to-Decisions” program on large-scale analytics for massive data sets. From 1986-2006, he held a variety of positions at the Massachusetts Institute of Technology’s Lincoln Laboratory, where he served as the associate chief technology officer, led three different research groups and conducted research in diverse technology areas. Avent has a broad range of interests and has conducted research in numerous areas, including environmental studies, neurophysiology and defense. The majority of his work has centered on machine learning, signal processing and dynamic probabilistic systems analysis. He has led several national panels in the areas of computer science, cognitive technology and signal processing and is an IEEE fellow. IEEE is the world’s largest technical professional organization dedicated to advancing technology for the benefit of humanity. He has a Ph.D. in biomedical mathematics and engineering from the University of North Carolina, Chapel Hill. He has two master’s degrees, one in electrical engineering from North Carolina State University and the other in biomedical mathematics and engineering from the University of North Carolina. His bachelor’s degree is in zoology from the University of North Carolina. Avent is also a 2005 graduate of the Greater Boston Executive Program at MIT’s Sloan School of Management. He and his wife, Terri, have been married for 30 years and have three sons.